Chicago Police Superintendent Eddie Johnson met with Chicago Mayor-elect Lori Lightfoot at the department’s headquarters Wednesday – a day after Lightfoot’s historic landslide win against Cook County Board President Toni Preckwinkle. Johnson said he and Lightfoot met for a couple hours, discussing the police department’s strategy for combatting Chicago’s violent summer months. Johnson, who was appointed as superintendent by Mayor Rahm Emanuel in 2016, presumably wants Lightfoot to be his next boss. During the city’s crowded mayoral race, Lightfoot stood out among her opponents by indicating she’d keep Johnson on the job at least through the summer months. Many of her opponents said they’d fire Johnson immediately. “We talked about that and I’m very encouraged about our conversation. I’ll put it like that,” Johnson said. A corporate attorney by trade, Lightfoot is familiar with police matters – in 2015, Emanuel appointed her president of the Chicago Police Board. She’s also headed the police department’s Office of Professional Standards and city’s Police Accountability Task Force. Last week, Johnson railed against Cook County State’s Attorney Kim Foxx, whose office abruptly dropped charges against “Empire” actor Jussie Smollett. Smollett was facing more than a dozen felony disorderly conduct charges stemming from an alleged hoax attack. 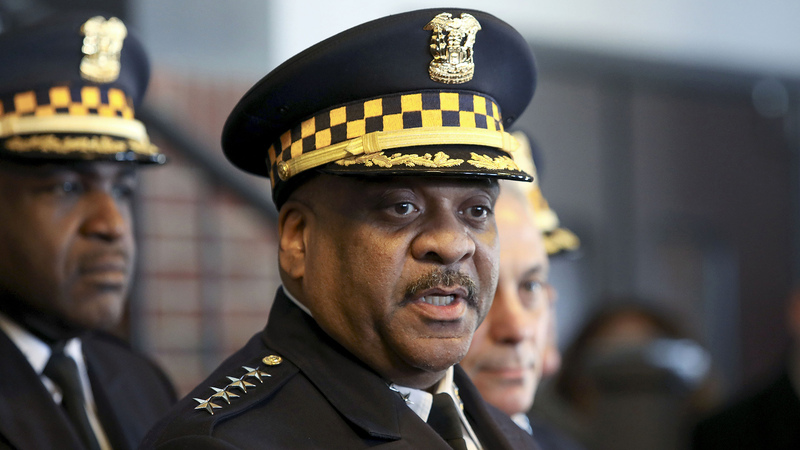 While Johnson seemed determined to move past the Smollett case Thursday, he did reaffirm his faith in the investigation. In a letter sent to Smollett and his attorneys last week, the city’s law department demanded the actor pay about $130,000 to cover the overtime expenses associated with the investigation. On Thursday, the end of a seven-day deadline imposed in that letter, the city’s law department said Smollett had refused to pay the fee and that the city was planning to sue the actor. A more deeply rooted issue facing Chicago is its epidemic of violence. On Monday, CPD announced that homicides and shootings during the first three months of 2019 had decreased 30 percent compared to that same period in 2018. But just a few days ago, 10 people were shot – two fatally – in the city, according to the Chicago Sun-Times.